so worth all of this effort. 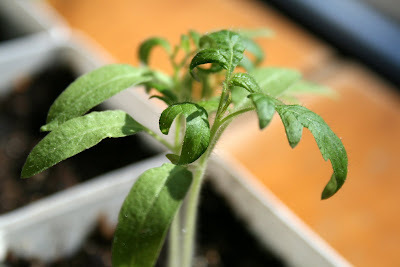 I think every gardener out there will agree that, next to the excitement of actually harvesting their produce, watching a seed transform into a seedling is one of the greatest joys to partake in. The process is still amazing to me, no matter how many times I have seen it. It helps to remind me of how even the teeniest things in life are so important to watch and to appreciate. Since there isn't always enough sunlight streaming in through my windows to give my babies what they need to get off to a great start, I am using artificial lighting. 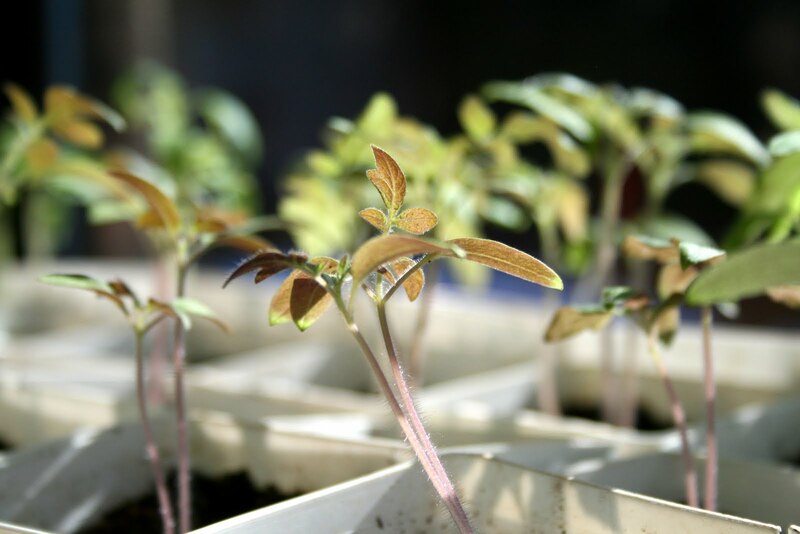 Having a good set of shelves with some fluorescent lights can help you to get a jump start on your garden. You can purchase some cheap shelves (the seedlings won't know the difference, believe me). And the lights seem to last for quite a while. I am not an expert on any of it, but you don't have to be a rocket scientist to figure out the basic needs of a plant. Soil, water, light...and a little bit of love (and I have got it all). It has been nine years since I have grown tomatoes and peppers from seed. I pulled out the shelves that I used back then....the lights were still attached and still working....WOO HOO! 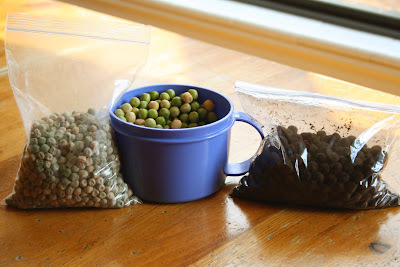 Since I promised myself I would plant peas this year, come snow or hail, I began by looking online and asking everyone who gardens when I needed to get them in the ground. No matter where I turned, I got the same response...."as soon as you can work the soil". 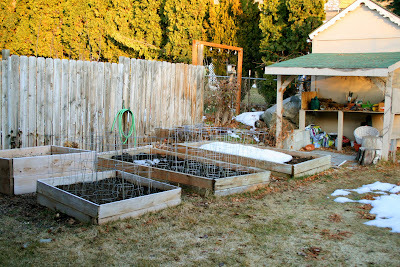 Well, I could work my soil as early as January, thanks to my raised boxes and the awesome growing mix that I use for my veggies (I will share more about Square Foot Gardening, for those of you who haven't heard of this technique, in another post). Patiently I waited until I had a few sunny days and most of the snow was gone from my beds to really get excited about putting them in the ground. For this year's peas, I chose the Sugar Sprint Pea . It is a variety that is supposed to do well with an early start, is an heirloom (which means I can harvest seeds to use for future crops if I so feel the urge), and it is completely edible (what a treat!). I began planning all sorts of wonderful destinations for my little pod buddies. I put the seeds in some water to soak overnight, all 250 or so peas. I was determined to get an awesome yield this year! They were so plump and beautiful after the nightlong soak, Strider asked if he could try one.....and, being the awesome mom that I am, I let him....then I had to try one as well....just to say I had (the peer pressure was horrible). And they weren't half bad....other than being completely tasteless...I guess that is why the birds are out there scavenging them when they can. 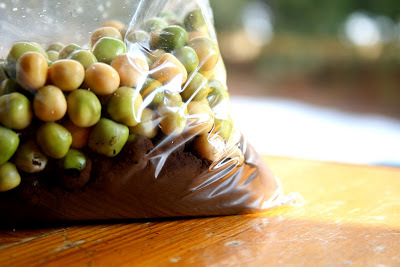 I placed the inoculant in some ziplock bags, dumped my peas in, zipped them up...all ready to shake, shake, shake, shake your baggy! Strider was seriously serious about his job as the pea inoculating shaker...so serious...and that table seriously needs to be sanded and refinished...maybe this year, even. He seriously enjoyed the experience...don't let the bored look fool you. He's really contemplating the universe and the role that the pea plays in the grand scheme of things. 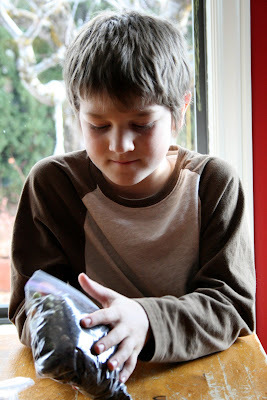 He didn't realize it could be so much fun to roll a bunch of swollen peas around in some brown dust...we should all have more pea planting parties. 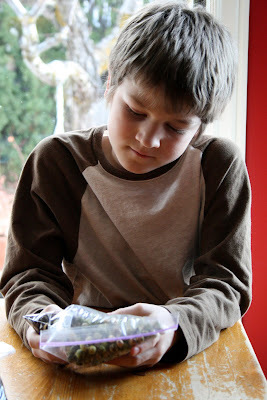 When he was done, Strider kept commenting about how they looked like little bunny pellets. I thought they looked like mini truffles. 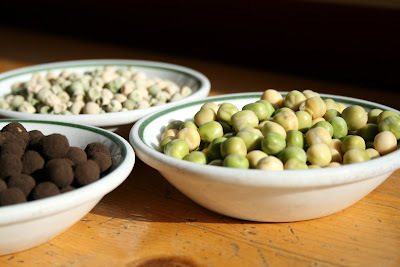 Needless to say, there would be no more tasting of the seeds after they took on their nitrogen fixing dust. This is the inoculant that we used....and the only reason I used it all up was because the expiration date is December of this year. There was enough in there that I could have easily used it for all 500 or so peas, but I felt like 500 peas may be going a little bit overboard. Shriveled, plump, and coated....from a bag, to a cup, to a bag. I worked the soil with Shooter and Strider, which was very easy to do, only because the soil in these boxes ROCKS the soil world! After about 20 minutes of working the soil (with our hands, not a tiller, hoe, or a shovel), we were ready to begin planting. We all made holes in the grow boxes for the peas...we put the peas in, one by one....until the boxes were full (my hands were a little too dirty and cold at this point to actually get any pictures of the process, but you get the picture, right?). 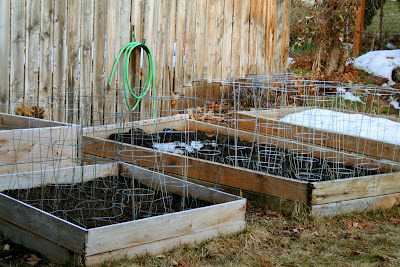 I put the tomato cages in for future support, in the hopes that they would somehow coax the little sprouts out of their long winter's sleep. The little prongs you can barely see poking up out of the soil....they're my own little crazy invention. You see, I have cats in my neighborhood. 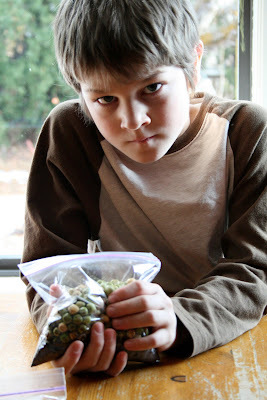 I created these little cat deterrents so I don't end up with my beds dug up and kitty nuggets instead of peas. I definitely love my neighbors more than I love gardening. I even love their cats. Hey, they can't help it if my garden appears to be a huge grouping of litter boxes laid out just for them. I'll let you know if it was indeed worth getting them in so much earlier. 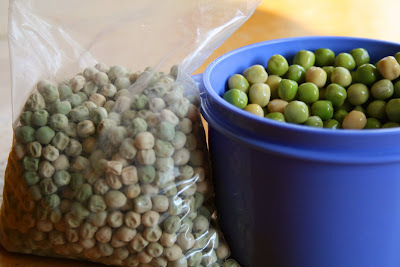 And before they are ready to harvest, I hope to have lots of yummy recipes and techniques for preserving peas. And yet, despite all of the desire I have to get started, despite the several months that I could use to get an early start during the winter, I never actually get going until well into spring. 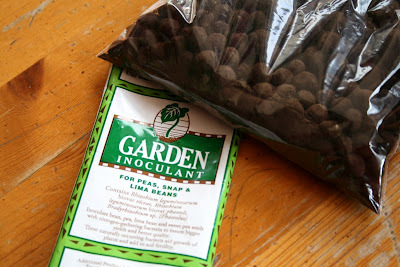 In fact, for the past 8 years, I haven't started my seeds before May. And by May, it is kind of late for tomatoes and peppers where I live, so I always end up buying them as plants instead. I have many valid excuses for why I haven't started seeds early; sickness, pregnancy, a new baby, too many other commitments, yada, yada, yada. Because of this, I easily spend at least a few hundred dollars on plants every spring. And because of my lack of skills in harvesting, preserving, extending the growing season, etc., the amount of money we spend never feels justified by the meager amount of produce we actually gain by the end of summer. Don't get me wrong, there is nothing wrong with buying mature plants from your local nursery (obviously I have been doing it, and will continue to, for the rest of my life). Yes, the cost is a little bit more to buy them this way, but for obvious reasons (duh, a lot less work). I am all for supporting local farmers (in fact, part of my plan for this year is to buy locally and to support grocery stores in doing the same). I have certainly not been able to single-handedly cover our family's nourishment needs with our little suburban yard, thus far, but I am willing to give it a try and learn in the process. There is this beautiful sense of accomplishment that comes from having grown your own juicy tomatoes from a single seed the size of a pin head. 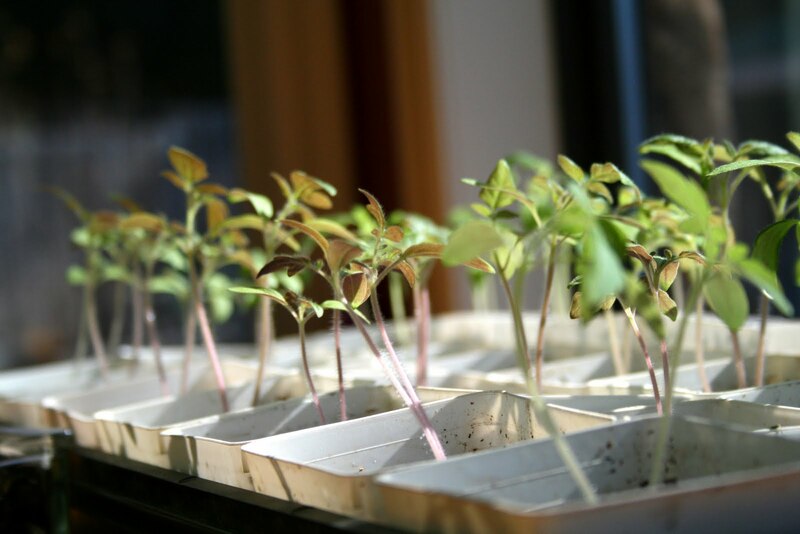 Whether you choose to grow the rare fruit or vegetable that you are unable to find at the grocery store or nursery. Whether you just want to be completely certain that you are eating organically. 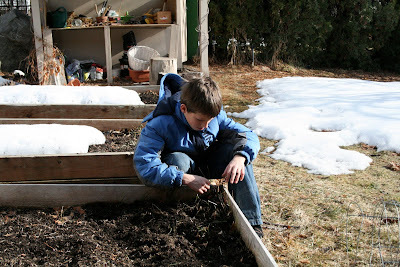 Whether you are trying to save money, help your kids to develop some good work ethic, or just need a great hobby to keep you outside breathing in some fresh air, having a garden is such a noble and worthy cause. Whatever your reasons for gardening may be, I believe it is completely worth all of the hard work and effort. Hey, it may even be therapeutic for you....it definitely is for me! And that, my friends, is why I have challenged myself this year. I am finally following through with my well intended plans......in my garden, in my kitchen, in my yard. And you are welcome to join me, through it all....the triumphs, the failures, the hard work, the disappointments, the rewards, the entire adventure. To all of you who wish to become avid gardeners and healthy eaters, myself included, here's to an early start....the very best way to begin. But nothing can stop the SiGuy from getting his sample of dirt....nothing. Wow! A tie dyed baby playing in the dirt and growing plants under fluorescent lights in the backroom....yeah, we're obviously hip. (Several Random) Disclaimers: No children were used for slave labor during the process of this experience, or for any other experiences that we are aware of. All individuals who were involved were compensated with lots of love, lots of food, and lots of good work ethic. 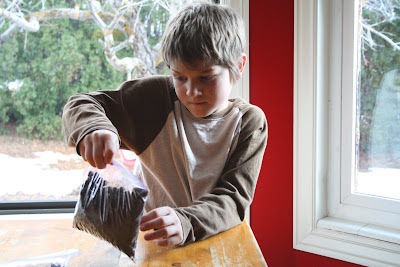 No children were harmed during the process of this experience, due to the ingestion of harmful substances, such as dirt (or, as we refer to it in the gardening circle, soil). Nobody was actually allowed to consume the soil...only allowed to pose for the camera...after innocently exploring...through nearly all of their senses...a little bit of good old mother nature. Also, there will be more pictures to follow, just in case some of you actually got the plant reference and are concerned for our hippie-loving family's well being. 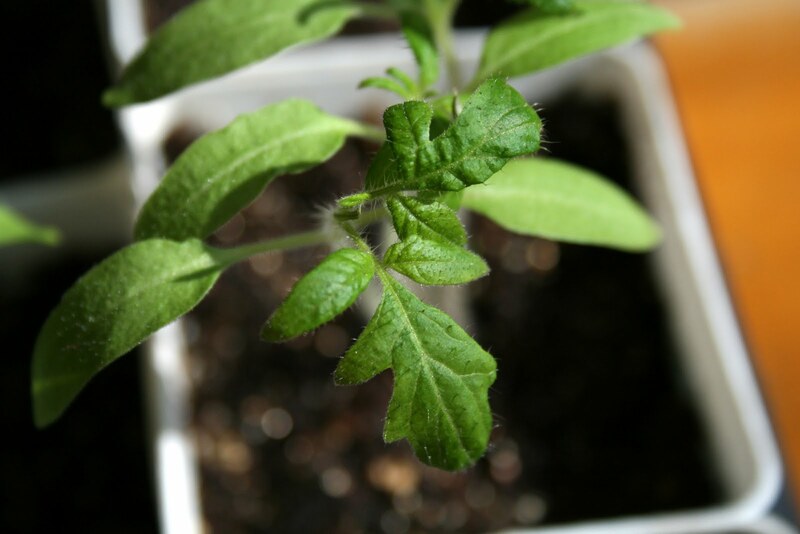 While tomatoes do have a similarity to other known plants, they are indeed...only...tomatoes.